Focusing on one of the region’s finest assets – local beef. 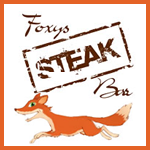 Enabling us to provide top quality meals at a reasonable price; Foxys Steak Bar entails a down to earth and friendly atmosphere, where a delicious meal’s awaiting you. Offering a range of homemade, local and organic items, you can be assured that your meal will reach a very high standard. We assure only the best local steaks enter and leave our kitchen, which is made possible thanks to our supplier, local butchers Gladwins Butchers, who have a long established reputation for their delicious range of meats.